New Pokemon Set, Puzzles, Games, and More! Posted: Sat Aug 05, 2017 3:24 am Post subject: New Pokemon Set, Puzzles, Games, and More! New Pokemon, puzzles, games, and more! Another fresh batch of new stuff has arrived at Merlyn's. 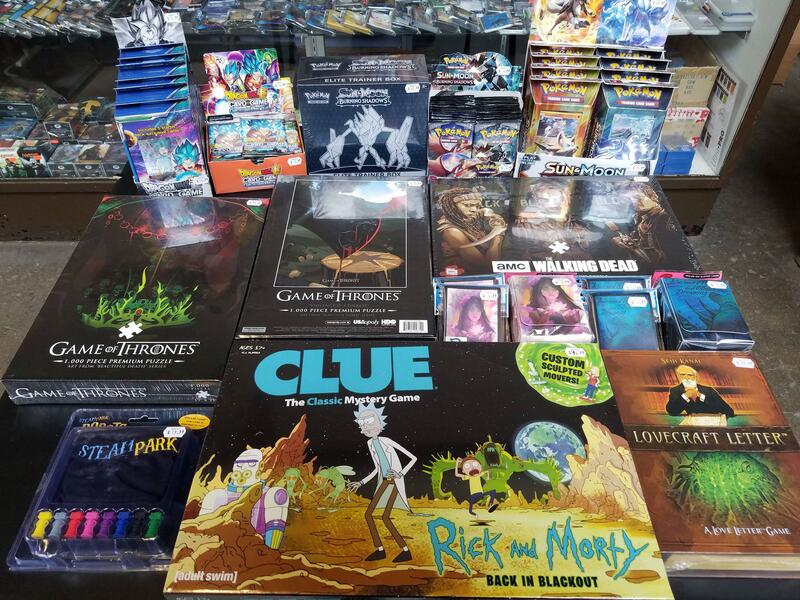 Among the awesome new items are theme decks, booster packs, and an Elite Trainer Box for the new Pokemon TCG set; Sun & Moon: Burning Shadows plus new Game of Thrones and Walking Dead themed puzzles, new games like Rick and Morty Clue and Lovecraft Letter, Dragon Ball Super Card Game starter decks and boosters, and new card sleeves and deck boxes, too. Come stop by the store and check out all this great new stuff today!